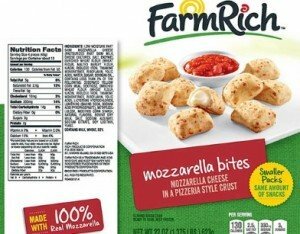 An outbreak of E. coli 0121 has been associated with recalled Farm Rich Products mini meals and snacks. According to the USDA’s Food Safety and Inspection Service (FSIS), there is a multistate outbreak of the bacteria that includes 24 people in 15 states. So far, eight of the patients sickened by the bacteria in Michigan, Mississippi, New York, Ohio, Pennsylvania, Texas, and Virginia report consuming Farm Rich products. You can see the complete list of recalled products at the USDA web site, along with label photos. The New York Department of Health found the outbreak strain of the bacteria in a Farm Rich frozen chicken mini quesadilla from a patient in that state. The CDC has not released any information about this investigation yet. E. coli 0121 can produce Shiga toxin, which can cause hemolytic uremic syndrome and other serious complications. It is one of the six non-0157 E. coli bacteria that the USDA has declared an adulterant in some raw beef products. FSIS is working with the New York State Department of Health, New York State Department of Agriculture and Markets, the FDA, and the CDC on this outbreak investigation. Symptoms of an E. coli 0121 infection include dehydration, bloody diarrhea, and abdominal cramps. Illness usually occurs 2-8 days after exposure. Most people recover within a week, but some develop HUS. Symptoms of HUS include fever, abdominal pain, pale skin tone, fatigue, small unexplained bruises or bleeding from the nose and mouth, decreased urination, and swelling. Anyone experiencing these symptoms should contact their doctor immediately.